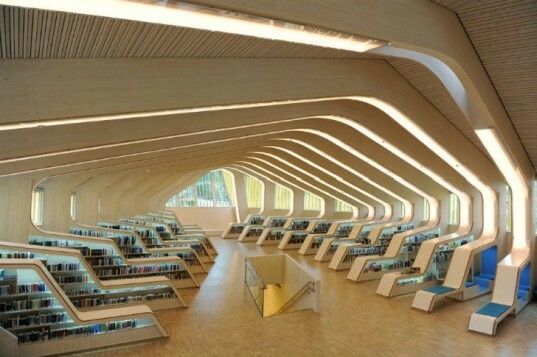 This rib-tastic library in Vennesla, Norway makes use of prefab gluelam construction that helps conserve resources as part of a comprehensive energy efficiency strategy. Vennesla Library by Helen & Hard is both a library and a culture house located in a downtown area. The urban infill project works in conjunction with pedestrian flow and encourages interaction and community gatherings. Natural daylighting, vertical sun shading, energy efficient systems and material resource efficiency are all part of the sustainability of the new library. Vennesla Library by Helen & Hard is also a community center that provides an important cultural space in the downtown area of Vennesla. Located facing an urban plaza with a large glass facade used for natural daylighting, the library encourages movement in the downtown area. The new building is easily accessible from the main city square and knits together the existing urban fabric. Additionally, a urban loggia with protected outdoor seating areas provides space for people to sit, rest and talk along with sun shading for the building. The interior features a striking design constructed from prefabricated glue-laminated beams. The rib concept allowed Helen & Hard to create a useable hybrid structure that combined a timber construction with all technical devices and the interior. The 27 ribs inform the geometry of the roof, the walls as well as the book shelves, furniture and reading nooks. By using gluelam beams, the design team was able to make use of a resource efficient material found locally in Norway. Additionally, the library makes use of energy saving solutions and is classified as a “low-energy” building, defined as class “A” in the Norwegian energy-use definition system. 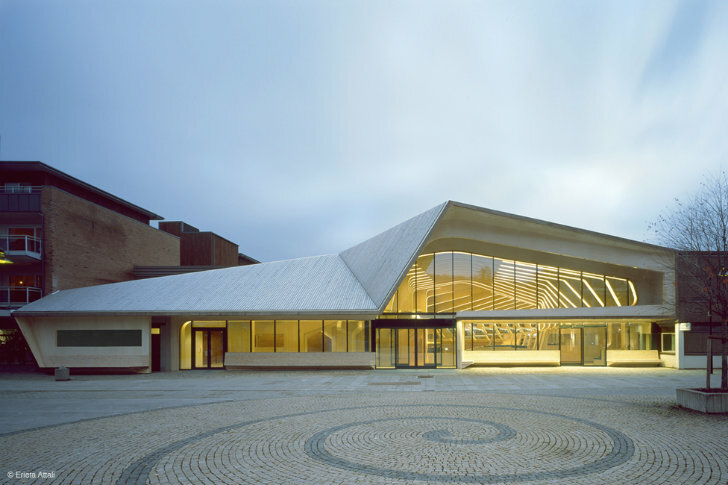 Vennesla Library by Helen & Hard is also a community center that provides an important cultural space in the downtown area of Vennesla. Located facing an urban plaza with a large glass facade used for natural daylighting, the library encourages movement and use in the downtown area. The new building is easily accessible from the main city square and knits together the existing urban fabric. Additionally a urban loggia with protected outdoor seating areas provides space for people to sit, rest and talk along with sun shading for the building. The interior features a striking design constructed from prefabricated glue-laminated beams. The rib concept allowed Helen & Hard to create a useable hybrid structure that combined a timber construction with all technical devices and the interior. The 27 ribs inform the geometry of the roof, the walls as well as the book shelves, furniture and reading nooks. By using gluelam beams, the design team was able to make use of a resource efficient material found locally in Norway. Additionally, the library makes use of energy saving solutions and is classified as a “low-energy” building, defined as class “A” in the Norwegian energy-use definition system. Lights on the ribs provide exceptional lighting in the library's main room. Vertical windows on the side provide ambient light. The building encourages pedestrians to walk through the space to access different parts of the city.